Nando's restaurant have responded to the widely tweeted news that Manchester United manager, Alex Ferguson will retire at the end of the season. 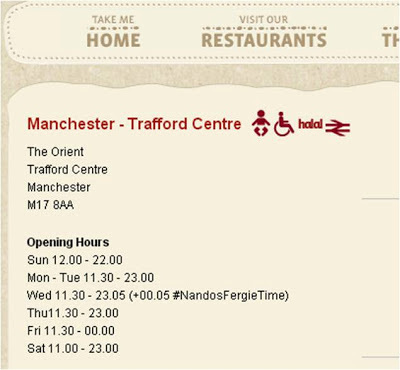 In recognition of 'Fergie time' (the belief of many that Manchester United are seemingly granted additional time at the end of matches when they need it most) Nando's have arranged for all of their Manchester restaurants to be open for an additional 5 minutes tonight. Nandos have tweeted about this and have been retweeted around 6000 times in 30 minutes! 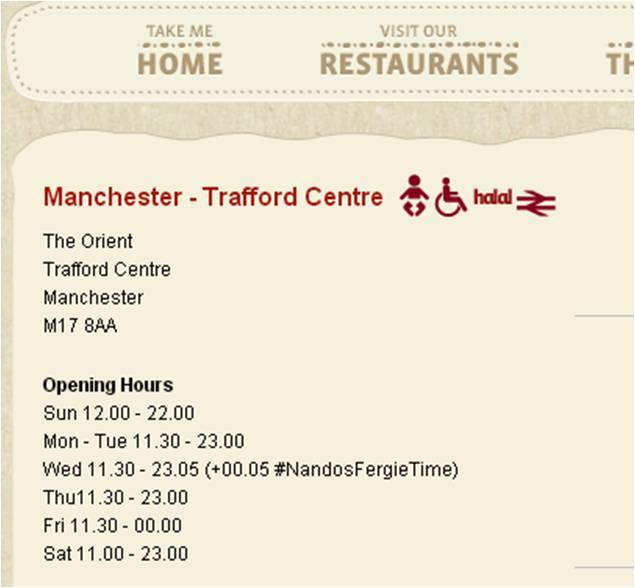 Nando's have even changed the restaurant opening times on their website! Always-on content marketing is about having a finger on the pulse and being quickly able to capitalise on the Zeitgeist. Another name for this is 'newsjacking' (the idea of piggybacking a news story in order to drive relevance and coverage) and #nandosfergietime does exactly that!